bill picked up some fresh gnocchi from the west side market this morning. we try to make sure we've got gnocchi in the pantry (freezer) all the time since that one summer when i thought it would be fun for all of us to make gnocchi. from scratch. i wish i had pictures of that day. i think i'm still finding flour in little hiding places in the kitchen from that grand experiment. there are a lot of things i'm pretty good at in the kitchen. cross gnocchi off that list. gnocchi is mine and bill's favorite pasta. we both find it easier on the stomach than regular pasta. so rather than put the bag in the freezer this morning, i planner dinner. 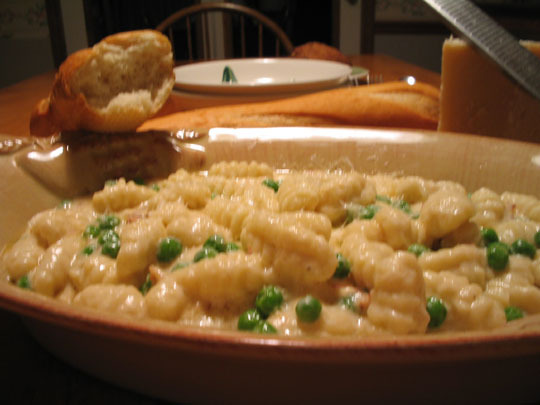 the alfredo sauce (minus the pancetta and peas) is a favorite of our boys (men). they like it the classic way -- over fettucini. simmer together the cream, butter, and salt and pepper in a saute pan until thickened. when you notice it's thickened some, you can stop if you want. it will thicken up more after you add the cheese, and you don't want it too thick. unless, of course, you do. stir in the cheese, simmer until melted. it's that easy. tonight i browned three slices of pancetta in a saute pan and added the cream and butter right into the pan with the bacon. i simmered the bacon in the cream mixture for a while to give the sauce a little of the smoky pancetta flavor. then i took it out, placed it on a plate between two sheets of paper towel and put it in the microwave for about a minute (maybe 1 1/2 mins) until it was crispy. chopped it up and added it to the alfredo sauce. i had the gnocchi (a pound) ready. i cooked about a cup and a half of frozen peas with the gnocchi. mixed everything (sauce, gnocchi, and peas) together and grated a little more cheese on top. p. s. i don't know about you, but a pound of gnocchi fed us (only bill and me) dinner, AND i've got 2 ziploc container lunches for this week all ready. tomorrow, i'll tell you about the really, really good pecan cinnamon muffin tops i made for breakfast tomorrow.